This morning dawned cold and frosty with clear skies and December sunshine: a perfect winter's day. 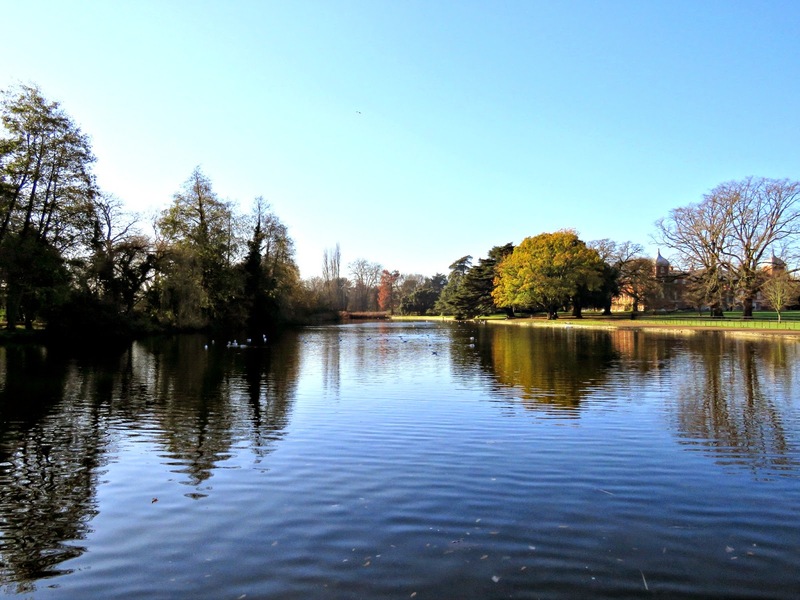 Emi and I headed out to Osterley Park to make the most of the good weather. I'd heard that they'd got all their Christmas decorations up and were opening the doors to let us in for a look at their Christmas bling. I've written about Osterley before (The Jersey paintings return to Osterley Park and Bluebells in Osterley Park). 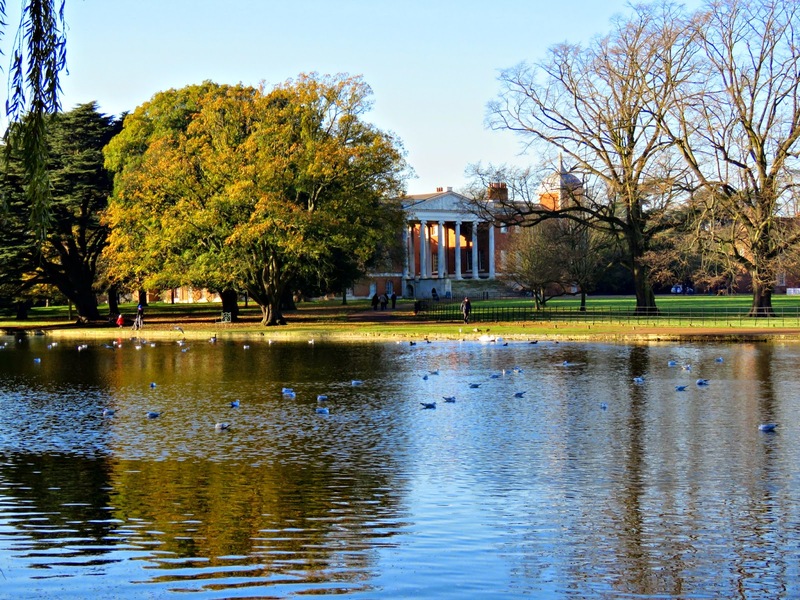 It's a wonderful National Trust property just down the road from where we live, and is one of our favourite haunts for walking the Wonder Dog. When we want some fresh air and can't think where to go this is usually where we end up. We had to leave the Wonder Dog behind as we were going inside, so we were able to stop and watch the ducks for a while. The Wonder Dog does not approve of ducks, and we normally have to walk quickly on by so as not to upset them with his barking. 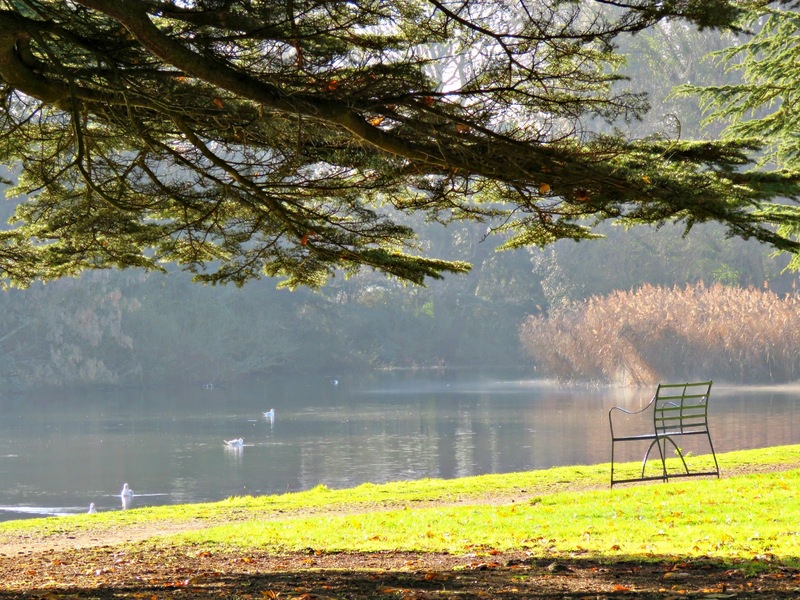 It's hard to believe that this place is in Greater London. You can just about make out the aeroplane on its descent to nearby Heathrow. As you walk around the estate you sometimes hear the roar of distant traffic, but otherwise it's incredibly peaceful. It's a great spot to come and enjoy Mother Nature's seasonal best. 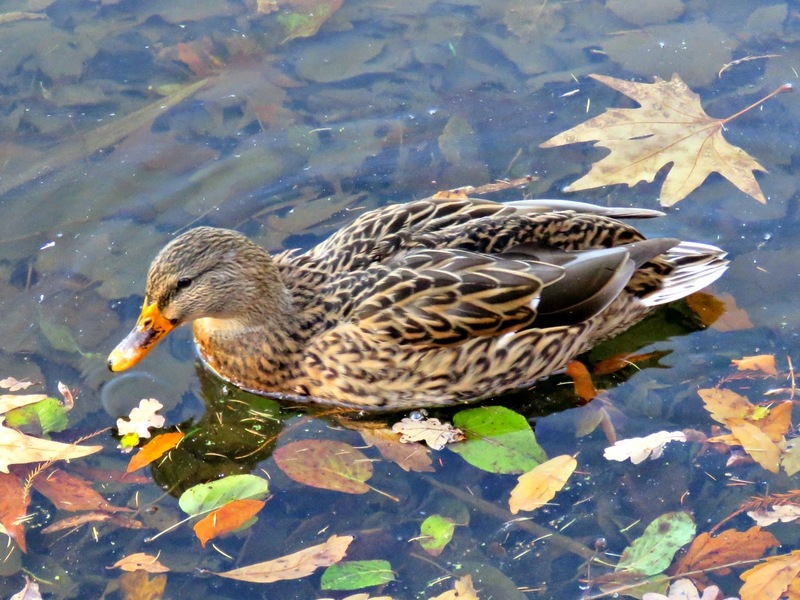 For those of us who live in the city it's easy to miss the passing seasons, but a quick trip out here soon puts us in touch with the natural world. I like to sit on these chairs, with the sun on my face listening to the birds. 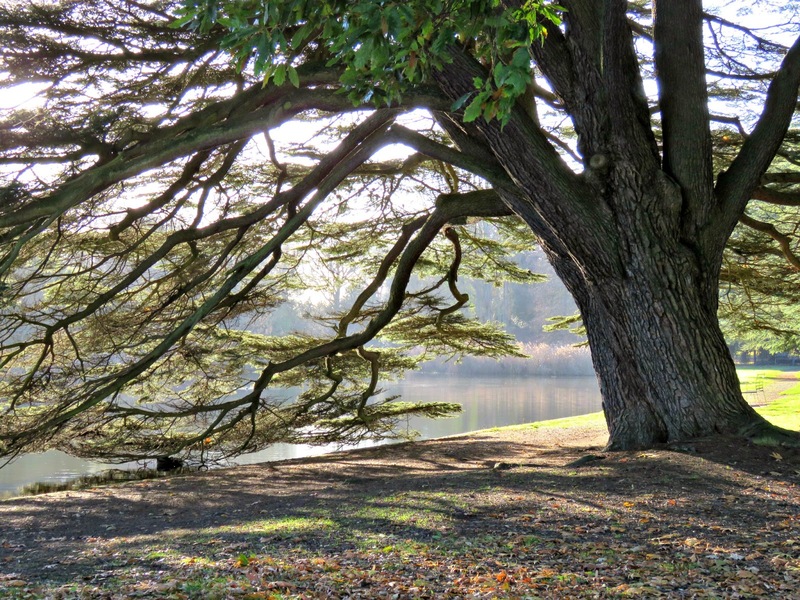 I love the majestic sweep of the branches of this Cedar of Lebanon that trail down to the water's edge. This old chap's got to be my ultimate Christmas tree. Another old friend of mine lives on the opposite side of the house. 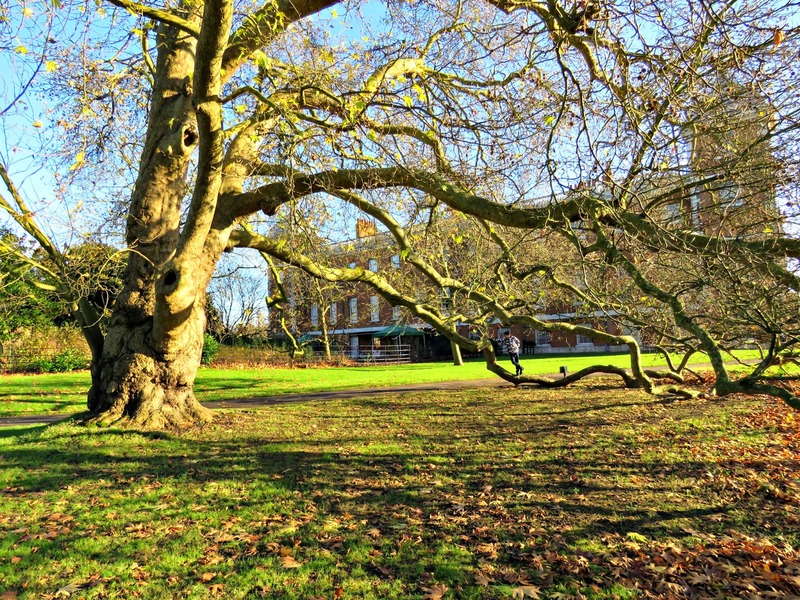 He's an oriental plane tree who's been there since about 1755. They think that he originally came from Iran or Turkey. Isn't he amazing? His branches grow in strange ways, almost like the arms of a monkey who leans on his knuckles as he walks along. Can you see little Emi standing amidst the branches to give some sense of perspective? If this old tree could talk, his tales would be well worth listening to. The rest of the gardens were looking neat, but at this time of the year they owe their splendour to the beautiful rise and sweep of the trees. 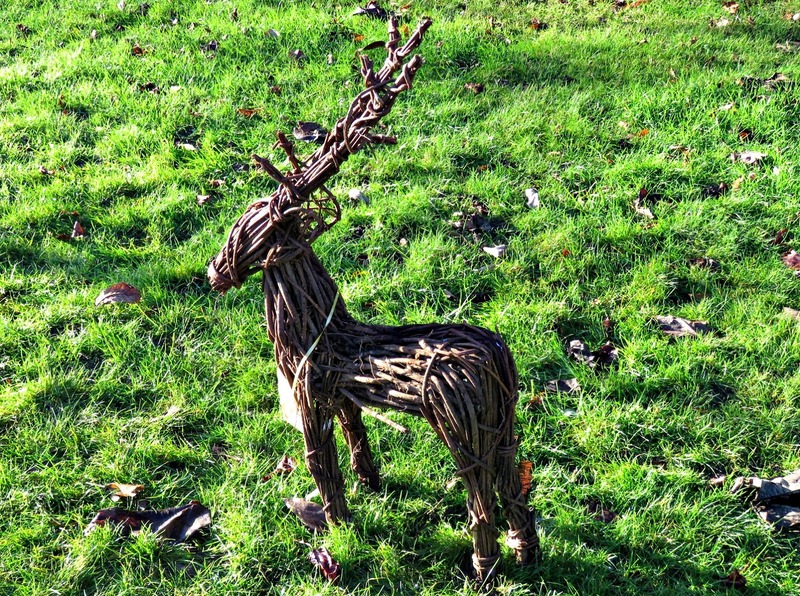 Here and there we found the odd little reindeer, flexing his muscles and gearing up for the Big Night. The gardeners had given each one a name. The chap above was called Blixen. Emi had a great time running from one to the next discovering their names and shouting them out into the cold air for everyone else's benefit. Finally we remembered what we'd come for and headed inside. 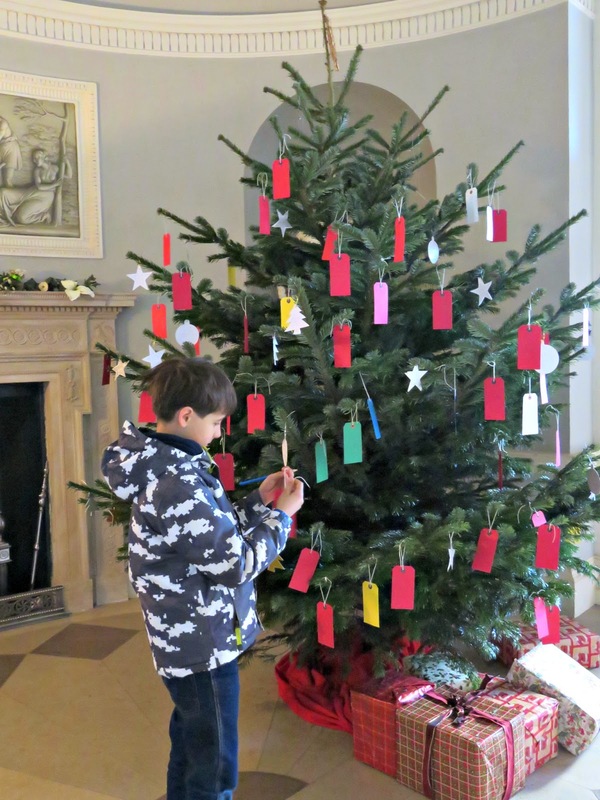 In the long gallery, one of the surviving Tudor parts of the house, we found the most magnificent tree. Doesn't it look grand? 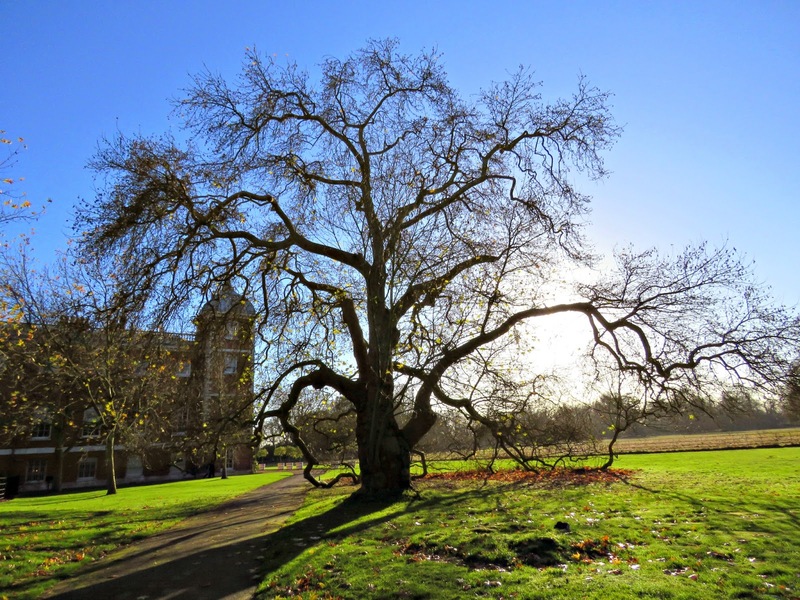 Queen Elizabeth I, the Virgin Queen, came to visit Osterley on at least two occasions. I like to imagine her striding energetically up and down in here on rainy days with her courtiers fluttering after her like great black crows in a newly ploughed field. It's a cracking room with exquisite paintings and objets d'art dotted around. One of the many, many things that I love about this place is the staff who volunteer to help. They're all so enthusiastic about the place. This morning many of them had dressed in stunning period costumes. And without exception they were happy to chat about the place and answer Emi's questions. Emi had a game of Devil Among the Tailors with a lovely young man who was bewigged (18th century style) and volunteering as a guide. The object of the game is to send the spinning top whizzing around the table to knock over as many skittles as possible. Each skittle has a number value and you have to take your aim with a view to hitting as many of the high-value skittles as possible. 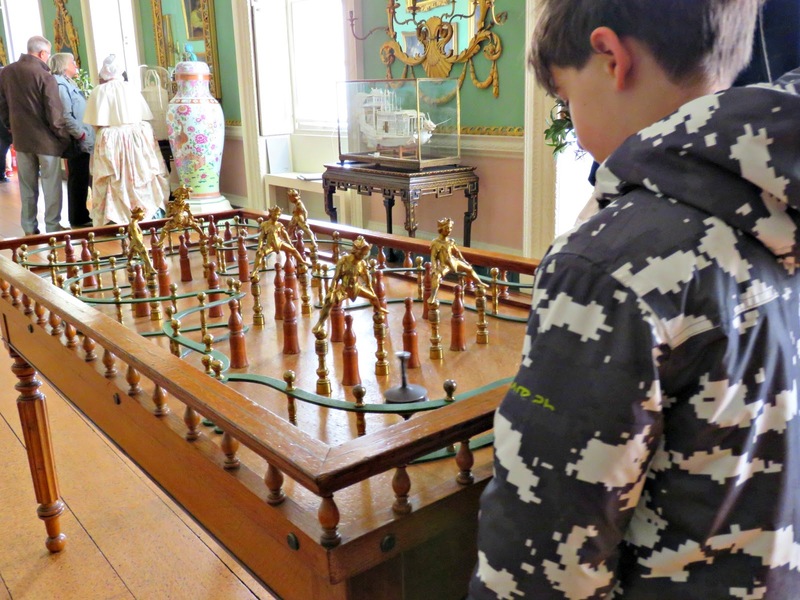 It's a game of skill and strategy that was once popular in London's many public houses. Devil Among the Tailors is a name that was given to the game of table skittles after a group of tailors kicked up a rumpus outside a London theatre where they were staging a play called The Tailors: a Tragedy for Warm Weather. The play satirised the London tailors, and they took umbrage at the way in which they were being portrayed. They showed up en masse on 15th August, 1805 and started to riot. The special constables of the day were helpless against the numbers of angry tailors brandishing scissors and whatever else they had to hand. The Life Guards were called in and they did the job of dispersing the rioters so effectively that they were compared to a ball ploughing through the skittles. And ever after the game of table skittles was known to Londoners as Devil Among the Tailors. Having made some Dried Orange Slice and Cinnamon Stick Christmas tree decorations I was interested to see how they had used dried fruit to make decorations too. 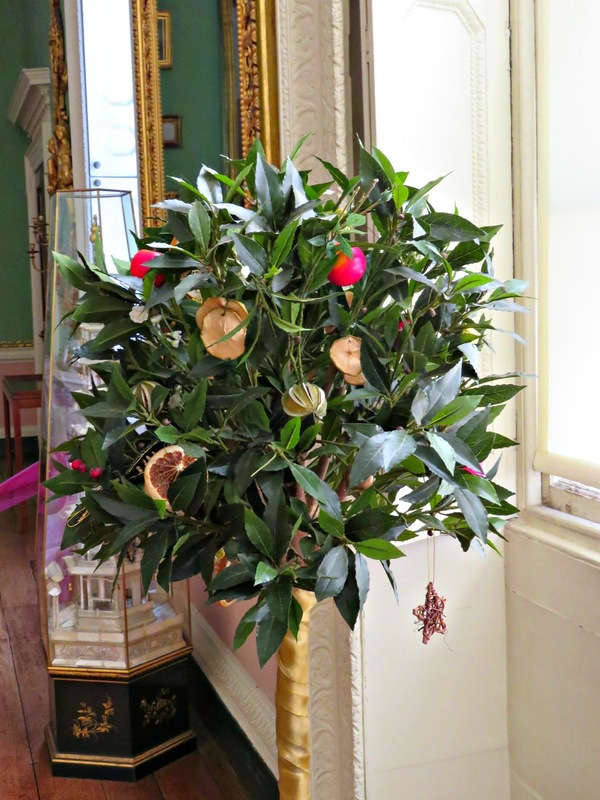 In the Long Gallery they'd brought in lots of standard bay trees, which looked amazing with slices of dried apple and orange and whole dried clementines and limes: so many ideas for next year ... . In the hallway they had a wishing tree, where Emi recorded his Christmas wish on a special label. Here he is with another of the lovely volunteer guides, writing it out carefully in his very best handwriting. And then he tied it to the tree along with all the other children's Christmas wishes. It reminded me a little of Buddhist Temples I've visited in the Far East where people write out prayers and tie them to trees in the Temple gardens. Our guide told us that this was once an authentic English tradition. I've never heard of it before, but as I think it's rather charming, it's one I'd be happy to adopt. 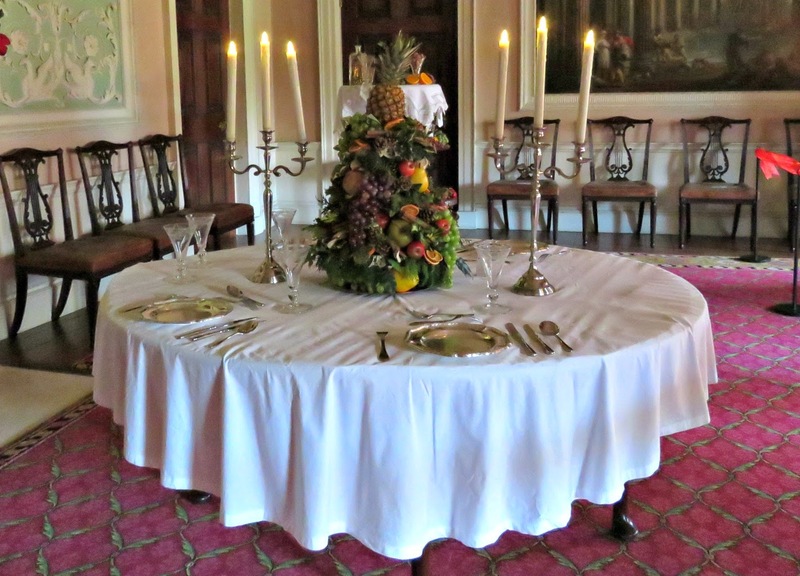 This wonderful table centrepiece caught my eye. Back in the day the pineapple on top was probably worth more than they paid the cook in a year. 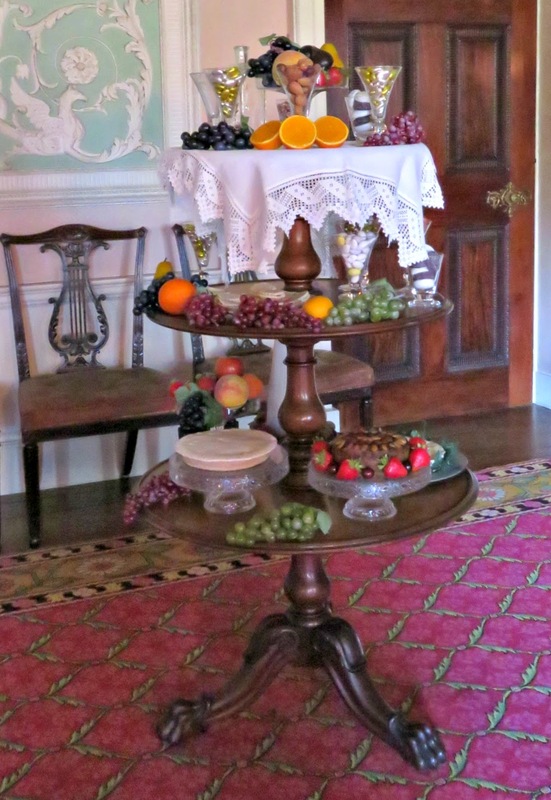 Or how about this dumb waiter, groaning under the weight of its seasonal delights? 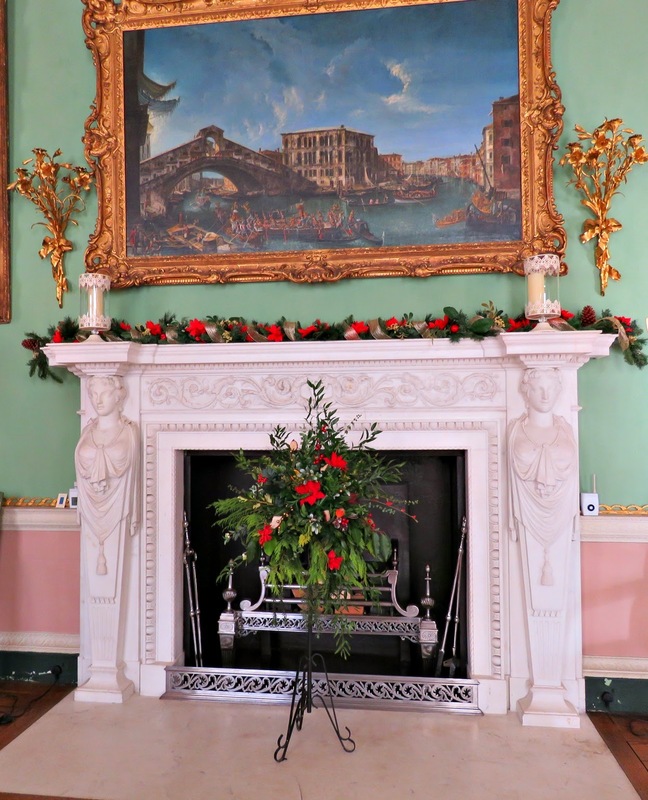 And every mantlepiece seemed to sport its own festive garlands and decorations. Down in the kitchens they were making griddle cakes and we had a go at stirring the Christmas pudding. The cosy warmth from the old range cooker and the smell of Christmas spices were magical. We came away with grand plans for further embellishments to our own modest decorations at home. Emi has spent a good part of the afternoon working on his paper chains. 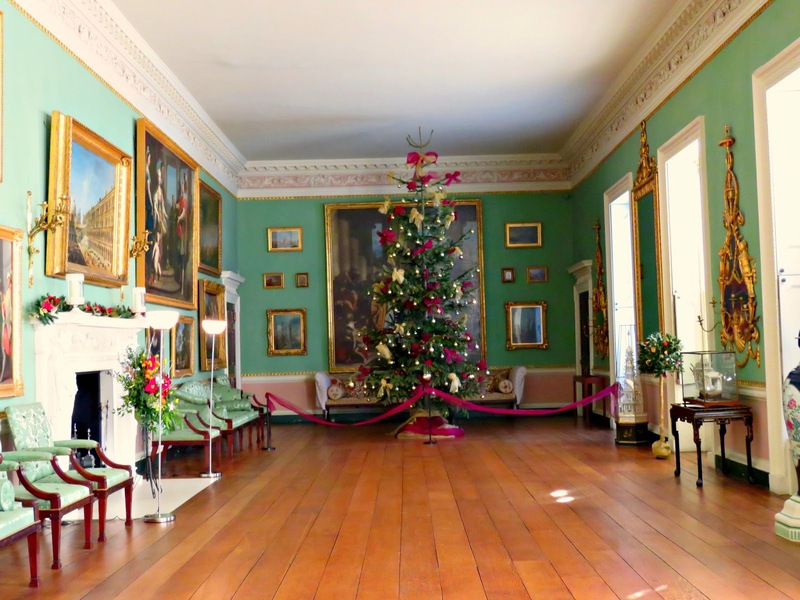 If you're in the London area and you need something to reboot your Christmas mojo you might like to consider a trip out to Osterley Park. 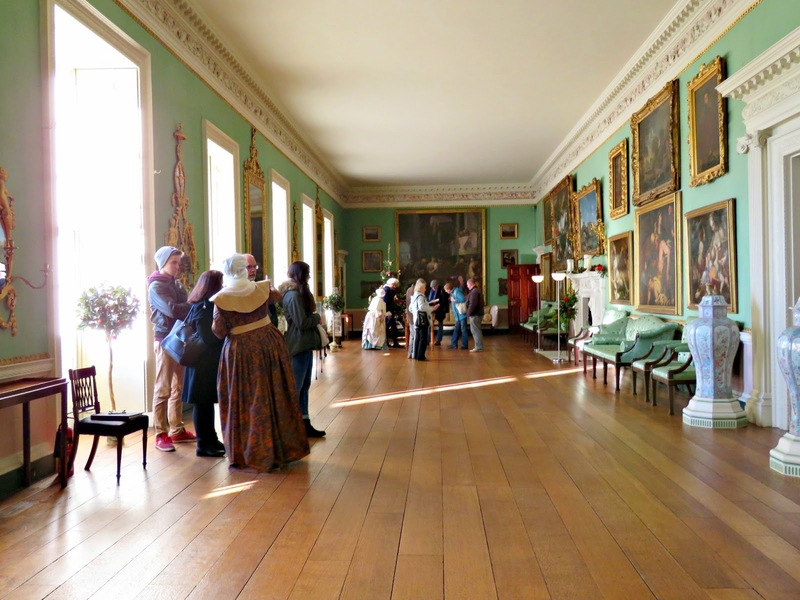 You can find their website here: Osterley Park. 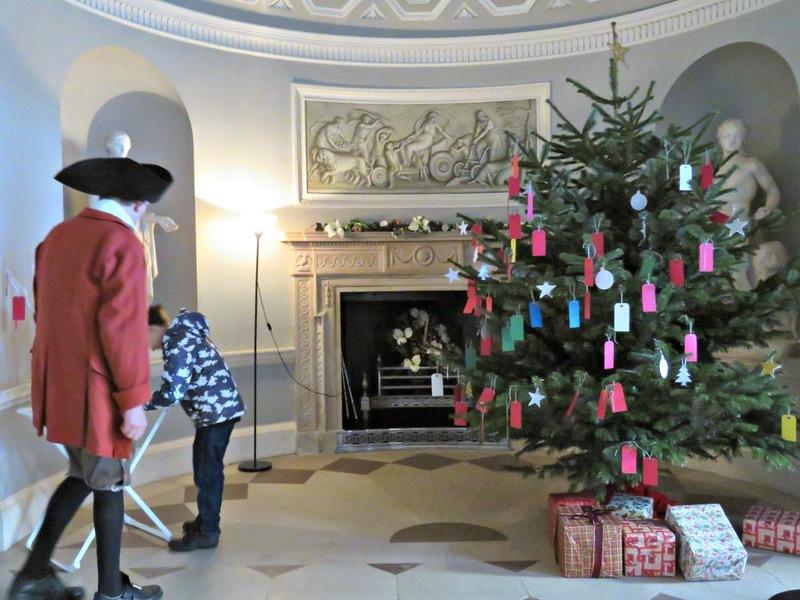 Thank you Bonny for the wonderful review of Christmas at Osterley. It's really lovely to hear how much you enjoyed not only the decorated house, but the gardens and parkland too. 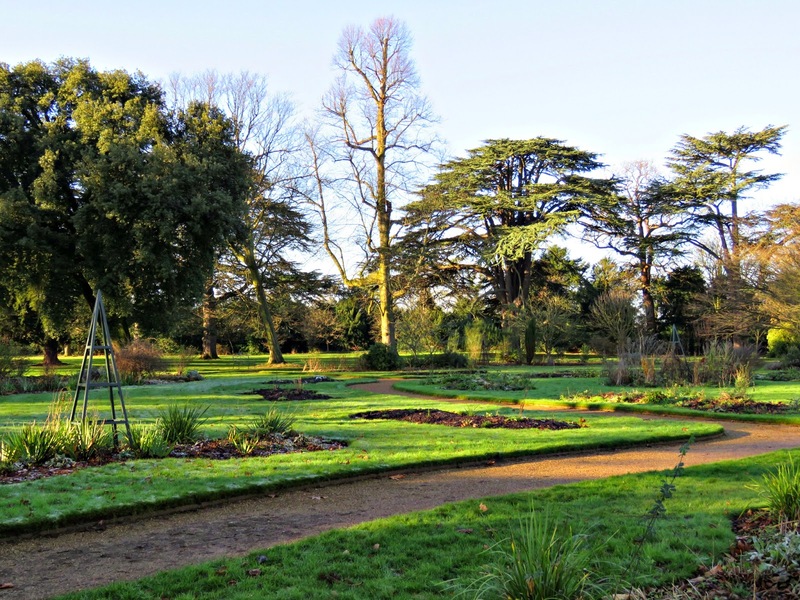 Don't forget the gardens, park and cafe are open all year now (park only 25 & 26 Dec) so how about a New Year's day walk? All the best, the team at Osterley. What a wonderful series of photos - thank you so much for sharing. 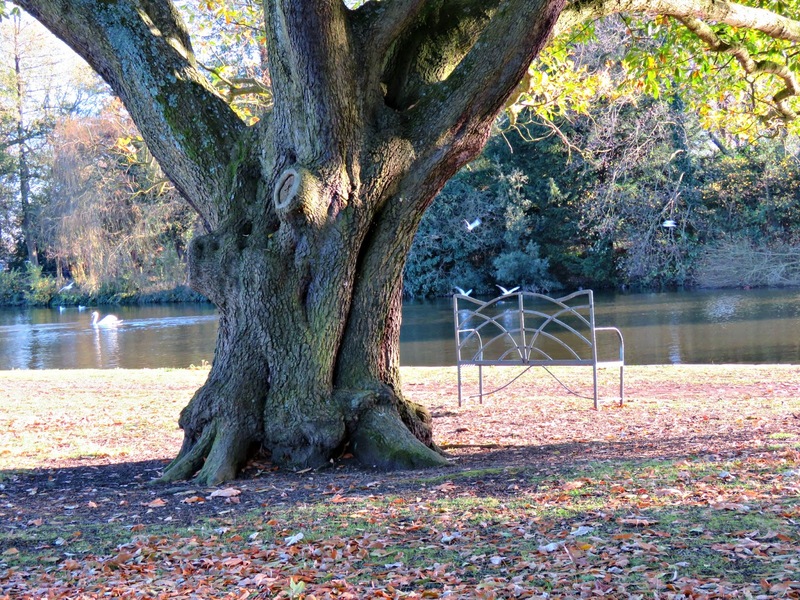 Beautiful images, I especially like the shots of the trees. It does look like a magical place. Gorgeous photos. Love sharing your adventure.